Quick update, tank is chugging along, with minimal maintenance, water change about once a month, green algae is going hard, I havent bother cleaning the black glass for ages... as you can see, I occasionally clean the front glass but that is a bit green in this photo, the fish seem to like it, tho all the loaches where hiding when I took this photo. 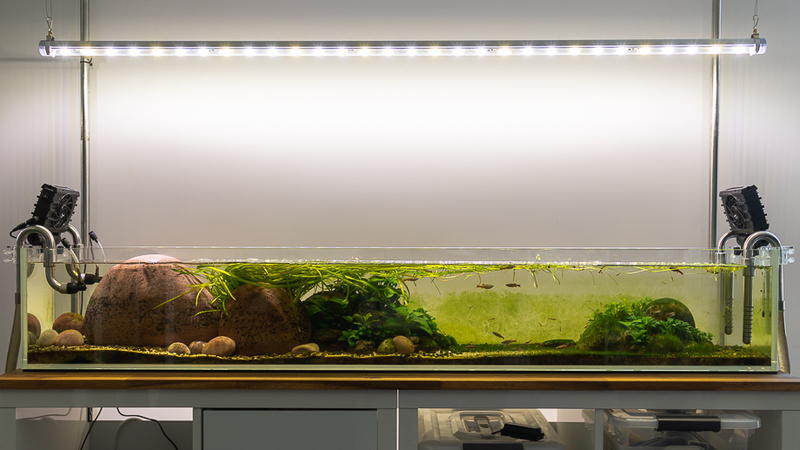 Also I shut down all my tanks apart from this tank and my 12g bookshelf blackwater. How are the fans holding up to these 40 degree days? looks good. (because it looks the same). 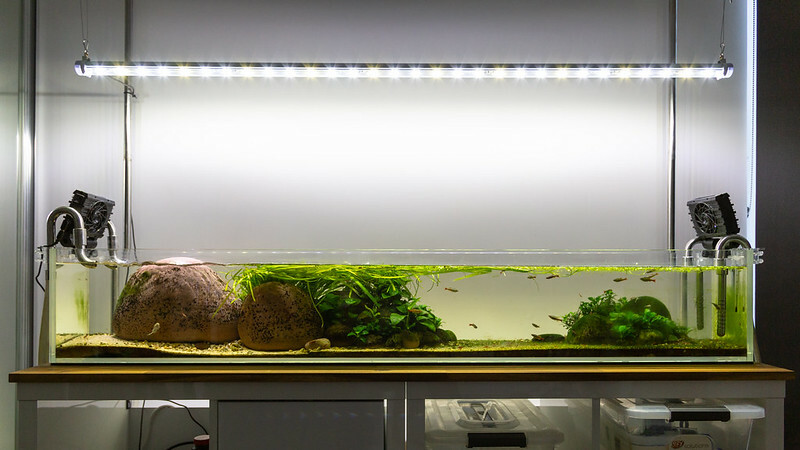 a true low maintenance tank. sad to hear everything else is shut down. it's a cycle i think that we all go through. I have lost a bit of interest in fish tanks, more due to space living in an apartment, such a pain to re-scape / clean / water change, I think I will try keep this tank and the blackwater running for as long as possible (both being slow growing they take little maintenance) then get out of tanks until I move into a house. Anyone have a sure fire way to kill BBA, its getting out of control in this tank, only on the hardscape, plants are algae free, I dont want to remove the hardscape because the rock are heavy and kind of hold up sand where the val is planted. tho it could be an option to remove all hardscape and either rescape or treat all hardscape out of the thank and re-build the scape. Problem is I want to keep the green algae and I assume using the 1-2 punch method will wipe out green algae also, also going to look into no more black beard, but I am pretty sure thats just glut / excel. I also wonder if Glut / Excel or high levels of h202 effect loaches, pretty sure they are considered scale-less fish?! Will post a full tank shot tonight. Kind of cleaned the glass the other week, couldn't be bothered removing pipes to do the side glass, I tired spot dosing the biggest rock with h2o2 to kill BBA and ended up spot dosing a loach who died about 2 days later... So for now I will live with the BBA until I do a rescape or pull out the rocks and soak them in a h202 solution over night. Interestingly the loaches seem to prefer "cleanish" glass as opposed to green algae caked on, perhaps as the green algae grows its softer / attracts them more. I removed small stones from the left of the scape as they attracted the most BBA, also removed the jet nozzles from the filter outlets, sand has since moved and exposed a cavity under the biggest rock, this is now where most of the loaches live. Looks good mate Well done. I'd say the loaches prefer the "cleaner" glass as the algae gets pretty hard over time I think from all the build up. Cleaning thick algae is usually harder than cleaning a mostly clean piece of glass with fresher algae. Reducing light will help reduce new BBA but old BBA can persist in very low flow and low light environments IME. High flow, high organics (?) and high light are usually it's preferences. Colm, where did you get the rounded rocks from? I'm struggling to find any... I've got a new tank planned at the moment. I got them from Slab and Garden City - 13 River Rd, Bayswater WA, they are pretty cheap compared to rocks you find in aquarium stores, like 50c a kg I think. Whats the plans for the new tank? Also I didnt know you where on the Aquarium Life forum, you must not have posted here for awhile ! Cheers, owell, its a pest I will have to learn to live with... got it in my blackwater tank atm, but the blackwater kind of hides it :P I think my BBA problems have been increased due to slacking with water changes. I think high flow is a stimulant for BBA, i always read "increase flow" as a way to combat BBA, tho in all my tanks the high flow areas have the most bba... also I probably let organics get out of control, have got back on top of water changes and I am trying to take more of an interests in my fishtanks again.... now that I only have 2 to look after! Awesome, cheers. Will check them out after work one day. As you can see from my join date I was one of the very early members here. Haven't posted for years as my tank has been sitting empty for 5-6 years since we built this house. Have just been putting it off until I was really motivated to get something going again. I want to do a reasonably easy to maintain, little to no plants, no CO2 tank. Have just ordered a custom 3D background for my aquarium and will be filled with driftwood, almond leaves, tannins and tetras of some sort (kept ember and gold tetras in my previous tank).